At least half of casino visitors possess a loyalty rewards card, studies show. With kiosks serving as the centerpiece of casino loyalty programs, there’s great potential to leverage those kiosks for marketing. In the early days of the gaming industry, casino bosses kept track of high rollers in their heads or a in a little black book. In return for dropping big bucks at the tables, players were rewarded with complementary perks ranging from free dinner at the buffet to a night in the VIP suite. While that system of offering comps to encourage player loyalty largely remains in place, these days information about those players is tracked by loyalty cards swiped at the slot machine or table game. 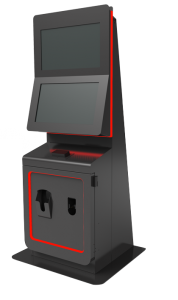 The technology at the heart of casino loyalty program is the kiosk. Players insert their loyalty cards into a slot machine or swipe it at the blackjack table, and once they’re done on the gaming floor they can insert that card at a loyalty program kiosk to see their reward balance. The points they accumulate through their play can then be redeemed at various amenities around the casino complex. And the fact that many casino patrons will use those cards during their visit makes a second screen incorporated into loyalty program kiosks the perfect vehicle to deliver additional messaging. There’s no shortage of data to illustrate the economic impact of the gaming industry. According to Statista.com, there were a record 82.5 million visits to U.S. casinos in the 12 months between April 2015-2016. St. Louis-based accounting firm Rubin Brown pegs revenue from more than 1,000 gaming operations in 40 states in 2016 at $73.1 billion, up 2 percent from the previous year. And the American Gaming Association estimates the casino industry results in an additional $52 billion of direct and indirect economic activity at small businesses. Obviously, any business getting their message into the midst of that activity is likely to get a boost. Loyalty program kiosks offer a perfect way to deliver those messages. It’s likely casino patrons are already well familiar with the concept of a kiosk thanks to the proliferation of self-order stations at restaurants, self-checkout devices in grocery stores and ticket-buying kiosks at movie theaters. That familiarity makes kiosks a natural fit for a casino setting and means little if any promotion will be required. In fact, odds are those patrons expect to have self-service devices available wherever they may go. There are several types of loyalty program kiosks around the casino property, says Traci Martin, director of vertical markets with Olea Kiosks. 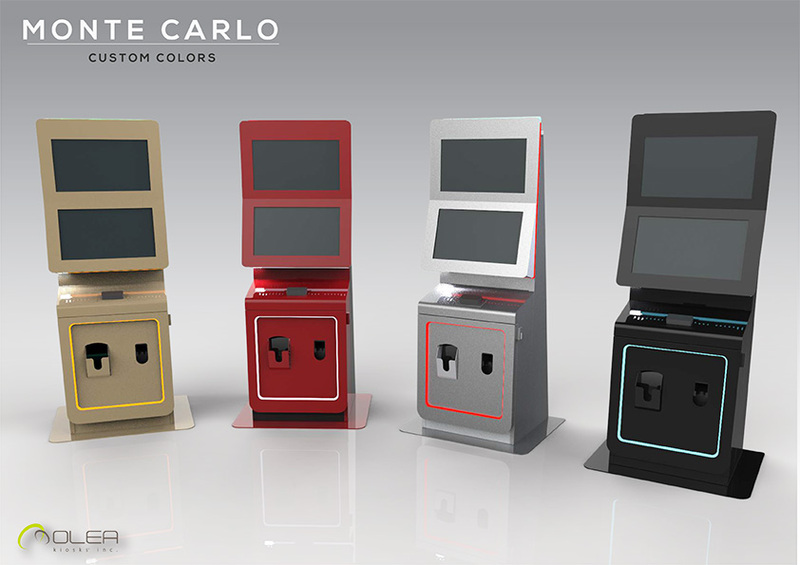 Olea’s Monte Carlo kiosk, for example, features two large LCD panels and programmable LED lighting. Along with license scanners and card printers, options for peripheral include a credit card reader, receipt printer, keyboard and trackball. The automated system allows users to check points, receive cash disbursement or add value to their cards at their own convenience. Remote monitoring capabilities can help ensure the kiosk stays up and running 24/7. The kiosk’s small footprint enables placement virtually anywhere and makes it easy to re-position. Brilliant LED lighting can be programmed to display any of thousands of colors in myriad patterns, all remotely. Olea has deployed gaming kiosks at casino properties in the United States as well as in Macau and Singapore. Loyalty program kiosks aren’t the only self-service devices on the casino property to hold an opportunity for second-screen messaging. Wayfinding kiosks and the TITO (ticket in-ticket out) units that turn a person’s winnings into cash and dispense coupons are also candidates for a messaging screen, along with hotel check-in/checkout kiosks, self-checkout devices at retail shops, ticket purchasing stations and tournament signup kiosks. Although the economic impact of the gaming industry is easy to see, information about the effectiveness of advertising on casino screens to date is largely anecdotal. Still, there are some safe bets to be made. Several industry studies estimate that at least half of casino patrons have a loyalty card, with many holding cards for several properties. With the ease of joining a loyalty program at a kiosk, and having that kiosk dispense the card within a few seconds, even the casual casino visitor is likely to sign up. What that means is that there’s a pretty good chance that at least half of casino visitors will spend at least several seconds in front of a kiosk messaging screen while they check their rewards balance. If they’re trying to accumulate enough points to receive a particular comp such as a free buffet dinner, they may be in front of that screen several times during their visit. With the median income of casino visitors pegged at about $60,000 a year, according to research firm VP Communications, those visitors are the prime target for nearly any brand. Casinos can boost their own revenue by displaying information on those screens about events happening on the property, promotions they may be running or information about in-house restaurants and shops. In addition, running ads for a nearby golf course, a zipline complex or other off-property activity offers the potential of generating an additional revenue stream. Even when those kiosks aren’t being used, that second screen can serve as digital signage to convey messaging to passers-by.